HomeNewsBurundian refugee incarcerated in Uganda: Is it another case of illegal police aided repatriations? Burundian refugee incarcerated in Uganda: Is it another case of illegal police aided repatriations? Two plain clothes security operatives on 9th August, 2018 illegally picked up and detained Mr. Maronko Marcel, a 42-year old Burundian refugee national living in Uganda. Mr. Maronko was picked from his Mengo based Hope of Glory Ministries, a church where he is a pastor, and remains detained incommunicado till today. 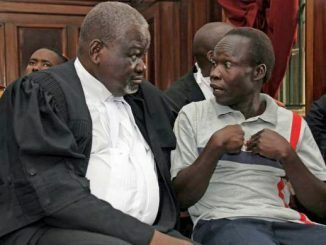 Despite Ugandan laws stating that a suspect cannot be detained for more than 48 hours before being formally charged in the courts of law, Maronko remains under detention without even access to legal counsel. He continues to be held illegally with no relative, friend or consular official accessing him at Jinja Road Police Station — his last known place of detention following his arrest. At the time of his arrest, witnesses say that the arresting security operatives told him that he was wanted by the National Central Bureau of Interpol, Kampala and an International arrest warrant was already issued by Burundi Interpol to have him handed over to the authorities. According to police, Mr. Maronko is accused of bank fraud; a claim that his family members refutes, claiming it’s just a concoction by the Burundi government officials so that they can have him repatriated to answer trumped-up charges. It is a pattern in the form of a self-fulfilling prophecy: an innocent person is kidnapped, held incommunicado and tortured, and is made to confess to false accusations, then is brought to the public where authorities are able to “confirm” that the suspect “admits” to the accusations being brought against them. 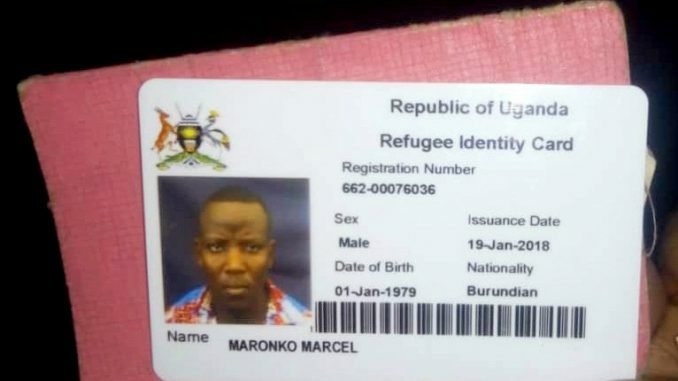 Maronko applied for refugee status in Uganda in 2016 and successfully obtained a refugee identity card on 19/01/2018 with registration number 662-00076036. His wife told the Kampala Dispatch that since his arrest, they are in fear, and spend sleepless nights in hiding with their five children together with other four they take care of. Before the family secured refugee status in Uganda, their elder son was shot in the head allegedly by government officials and Maronko survived narrowly, his wife reveals to this publication. She is calling for help and intervention from Ugandan authorities and Human Rights bodies to quickly intervene and save the life of her illegally detained husband. Media reports through what they called ‘highly confidential source’ alleged that Uganda had negotiated and signed an extradition treaty to repatriate Rwanda dissidents and refugees living in the country. Other reports revealed that Ugandan police officers allegedly collaborated with Rwandan intelligence to kidnap and illegally repatriate Rwandan nationals seeking asylum in Uganda — allegations that Ugandan government has vehemently denied to ratify, calling it a mere propaganda. They may have fled abuses in their country, but several refugees this publication have talked to on condition of anonymity, say they now live in fear for their safety and do not feel beyond the reach of either their country of origin or the Ugandan government for protection. Many have expressed concerns over their safety because some are targeted as members of political opposition, civil society or pressure group leaders/members or activists back home. Several have narrated to Kampala Dispatch of being followed and photographed, or receiving regular threatening text messages or phone calls from unknown numbers from what they believe to be security agents, or had men banging at their door in the middle of the night. Since the political crisis that erupted in Burundi in April 2015, many Burundians fled the country after a failed coup that led to increased violence, threats, torture, killings and enforced disappearances of their family members and other abuses, therefore they sought protection in Uganda and other neighbouring countries. The UN Commission of Inquiry on Burundi, last year stated that some refugees they interviewed outside Burundi, including Uganda, said they had recognised intelligence agents in their country of exile. Other groups have documented an alleged assassination attempt on several refugees in Uganda and a pattern of threatening phone calls, repatriations and mysterious killings of refugees. 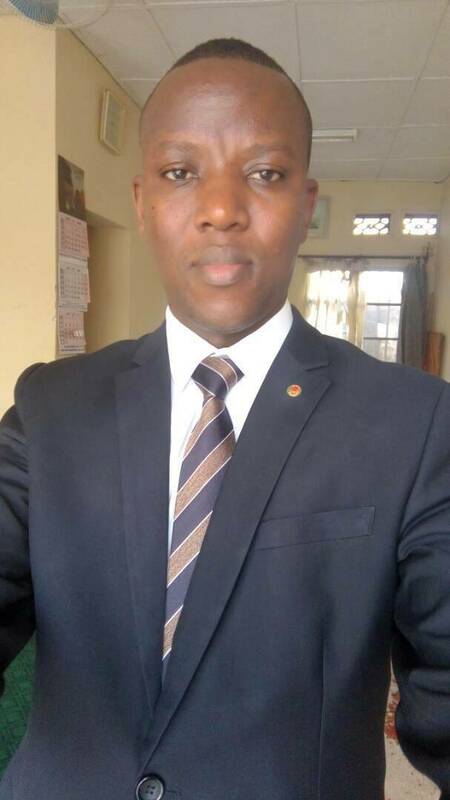 Illegal detention and repatriation of any documented or undocumented refugee seeking refuge or asylum violates international law, in this case Mr. Maronko Marcel, a Burundian refugee who fled to Uganda together with his family for safety. On which legal ground then is Mr. Maronko being held incommunicado and most probably as we speak, he may be in the process to be dragged back to Burundi, a country where him, and his family feel insecure? Is it not a crime to repatriate refugees without going through courts of law? Last year, there was aggressive campaign by Burundian President Pierre Nkurunziza’s government to encourage more than 350,000 refugees in neighbouring countries to return home. Several analysts suspected that the real reason for the pressure put on the refugees to return home was that the government was afraid that political opposition could be gaining strength in the camps, far away from the prying eyes of President Nkurunziza’s government. Bornwell Kantande, the UN refugee agency — UNHCR Resident Coordinator is on record stating that refugees can only go back to their countries when they are assured of their safety and security. 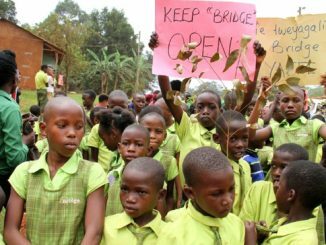 Uganda is an important mediator in Burundi’s peace process which has reached an impasse and openly contradicting President Nkurunziza’s government would not help. Since the emergence of political and ethnic-based civil war conflicts in the war-torn Burundi, there has been uncertainty among Burundian refugees if they should decide to go back home, and this has led the Ugandan government to clarify that it will stand by international law and that, at this point, no refugee will be repatriated against his or her will. Killings, torture and other inhumane abuses are still happening on a daily basis in Burundi. So people have a right to flee. Refugees will know when peace returns to their country. Nobody wants to live outside their home country. Uganda must do more to uphold its responsibility under international law to protect refugees on its territory, especially at this time when its security organs have allegedly been linked to kidnaps and illegal repatriation of refugees in the country. Uganda Police Force during the leadership of the already detained former Inspector General of Police (IGP), Gen. Kale Kayihura, was embroiled in a number of allegations that nearly dented diplomatic relations between Uganda and Rwanda with damning claims linking senior police officers, collaborating with Rwanda’s Directorate of Military Intelligence (DMI) and Rwanda Patriotic Army agents to kidnap and illegally repatriate Rwandan refugees living in Uganda at the orders and instructions of former IGP Kayihura, of which some refugees are said to have mysteriously disappeared, and others ended up killed. Nine officers were arrested by Uganda’s Chieftaincy of Military Intelligence (CMI) for charges that include conspiracy with Rwanda to illegally repatriate Lt Joel Mutabazi, a former bodyguard of Rwandan President Paul Kagame and others. Mr. Mutabazi was in 2013 reportedly kidnapped and handed over to Rwandan security operatives at a secluded location near Rwanda border. Over the years, there have been repeated allegations by several intelligence agencies that Rwanda has managed to facilitate a network within police establishment using its diplomatic channels to enable her to have its critics and opponents unlawfully picked up from Uganda and elsewhere. On April this year, Presidents Yoweri Museveni and Paul Kagame rekindled their friendship which had been on the rocks over brewing security tensions between Kampala and Kigali, and this led the two leaders to hold a meeting at State House Entebbe. Uganda is on record claiming it maintains its cracking down on suspected Rwandan spies harassing Rwandan refugees and threatening national security. Some of the suspected Rwandans have been deported by Ugandan armed forces while those facing serious charges have been tried before courts of law. There was an incident November last year at Nakivale settlement refugee camp in Isingiro district, in Uganda where a refugee was attacked by unknown attackers, they shot him in the chest and took off. 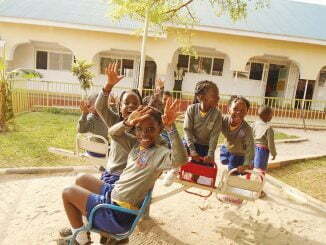 Police later reported the attack as a robbery mission saying; “the assailants wanted to rob Shs. 38 million from the deceased,” a claim critiques said it lacked credibility as such a poor refugee would not possess such amounts of money in the refugee camp. In the early morning hours of November 30, 2011, a Rwandan journalist Charles Ingabire, was shot and killed in cold blood at a bar along Martin Road in Old Kampala. Ingabire was the Editor of a Kinyarwanda-language online newspaper, Inyenyeri News, and was known critic of President Paul Kagame. He had been in exile in Uganda since 2007. Several refugee Rwandan and Burundian victims living in Uganda have disclosed to this publication that their relatives, spouses and loved ones have been taken away with people who only identified themselves as security operatives, and never to be seen again. Some recount armed people kidnapping their closed ones. Early this year, a group of disgruntled victims (Rwandan descent) petitioned the Speaker of Parliament of Uganda, raising fears over possible kidnap by the government of Rwanda with the help of elements in Uganda’s Police Force. “We the undersigned representatives of Rwandan Asylum seekers and Refugees in Uganda have decided to petition you and through the Parliament of Uganda, about continuous repressive activities by some security agents from Rwanda acting in liaison with some of their security colleagues from within Uganda,” a petition lodged by six victims on November 29th to Deputy Speaker Jacob Oulanyah reads in part. In the petition, they said refugees have been targets of abortive and successful assassinations, abductions, disappearances in many countries including Uganda, Democratic Republic of Congo (DRC), Kenya, Zambia, South Africa, Mozambique, Belgium and the United Kingdom. A trend is emerging that is increasingly making refugees who sought refuge in Uganda, feeling unsafe in the country. Ugandan authorities, United Nations Refugees Agency (UNHCR) and humanitarian organisations responsible for protection of refugees in Uganda must do more to increase the perception by refugees that adequate protection is being provided and that reported security issues are followed by timely and adequate action. Ugandan government should urgently raise awareness about the protection system in place and how to access it, as well as regularly follow-up on any complaints with those concerned. Only if this is improved, will refugees living in Uganda feel secure in the country where they fled to after escaping insecurity and human rights abuses in their country of origin.